← Cast is Hot in Cleveland This Week! The Ladies Wow the Crowd in Downtown Cleveland! 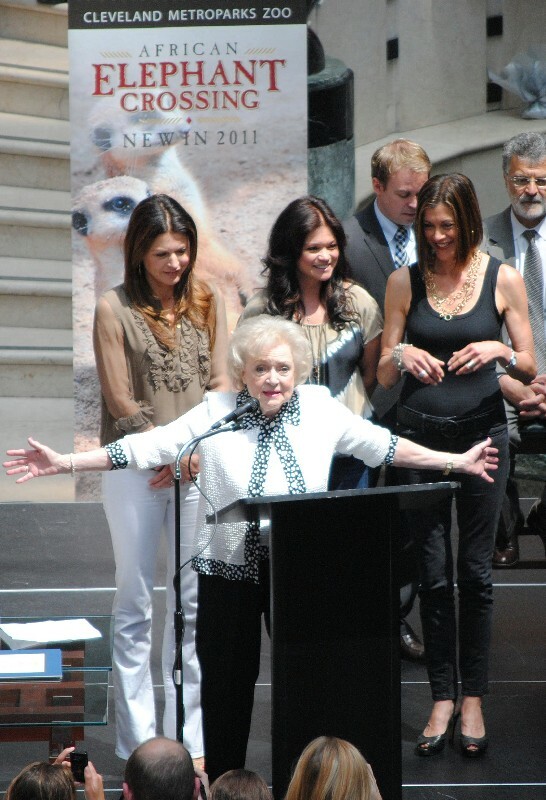 The cast of Hot in Cleveland received Keys to the City from Mayor Frank Jackson. 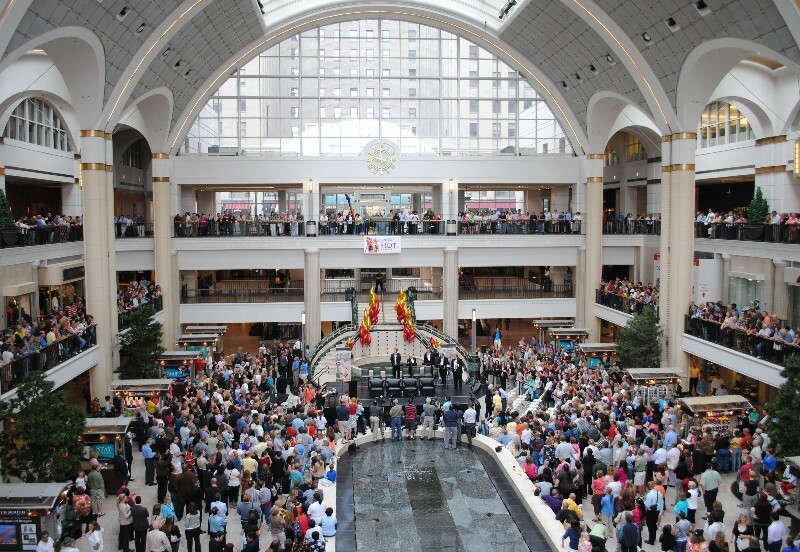 Hundreds of Clevelanders crowded Downtown’s Tower City to catch a glimpse of the cast of TV Land’s hit comedy series, Hot in Cleveland today (Thursday). The whole cast was on hand to wow the crowd: Valerie Bertinelli, Jane Leeves, Wendie Malick and, everyone’s favorite, Betty White. 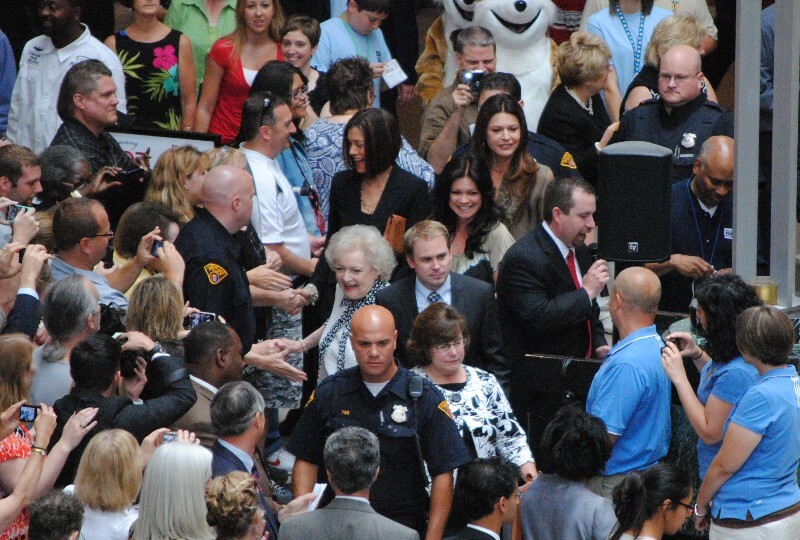 “Betty White, you are my world!” a woman in the crowd shouted. In true Cleveland form, fans didn’t miss an opportunity to slam Le-what’s-his-name. 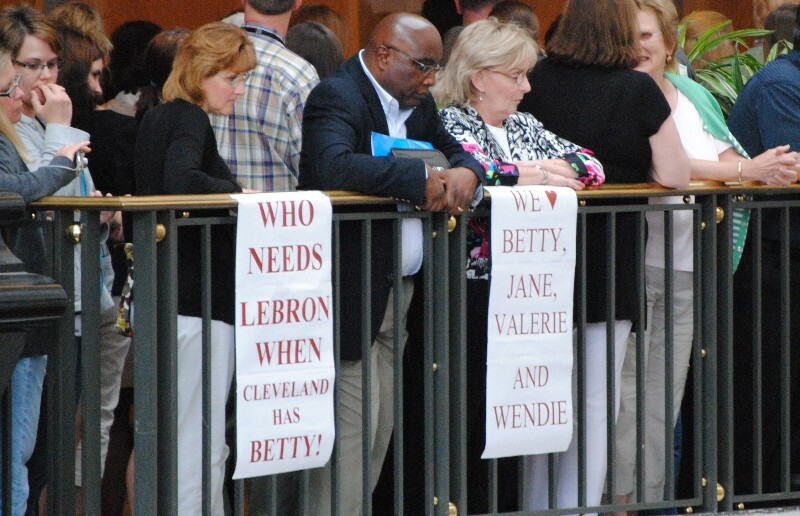 Who needs LeBron when you have Betty White? The Ladies of Hot made managed the crowds easily as they made their way to the stage . . .
. . . but were visibly moved once they were able to take in the full scope of the three tiered gathering. The hometown favorite (married a local boy), Valerie Bertinelli, is thrilled to have the Key to Cleveland! The Ladies of Hot talk to the crowds and the sun starts to shine. 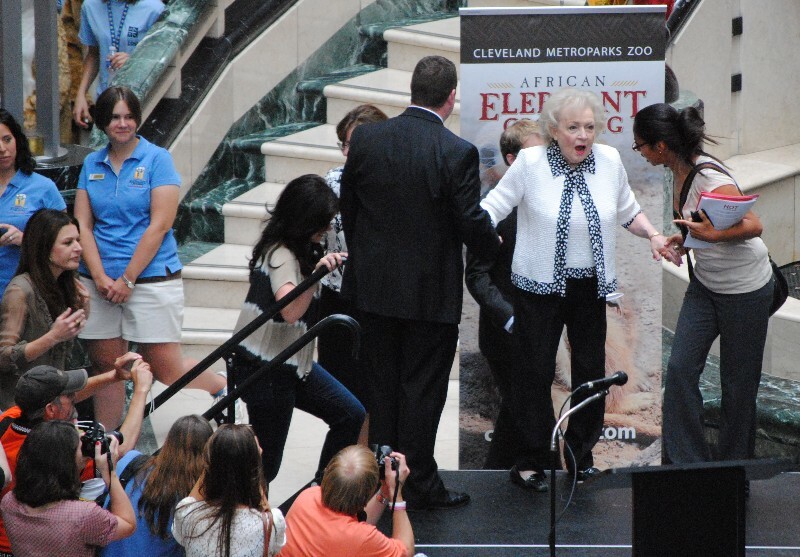 Betty White describes her morning at Cleveland's renowned Zoo. This entry was posted in Cleveland Rocks!, Hot in Cleveland and tagged Betty White, Downtown Cleveland, Hot in Cleveland, Jane Leeves, Mayor Frank Jackson, photos., Tower City, Valerie Bertinelli, Wendie Malick. Bookmark the permalink. 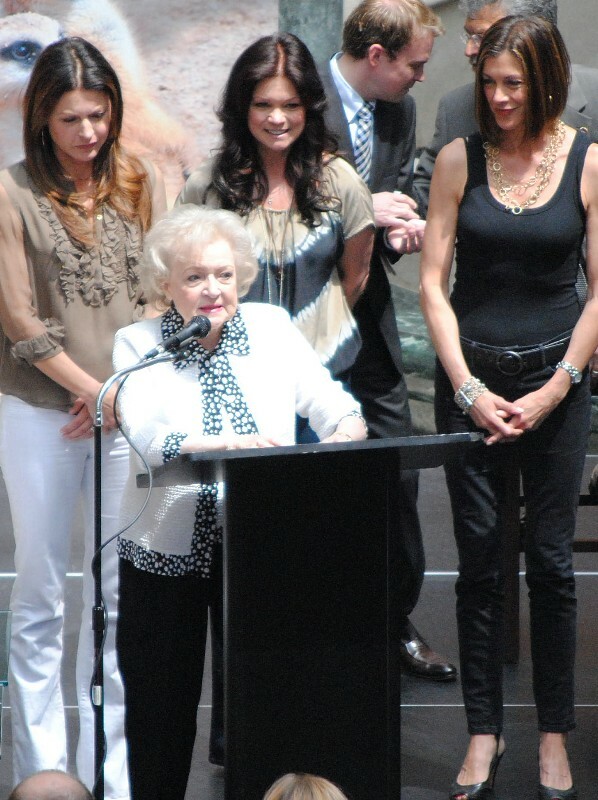 Love the cast in Hot in Cleveland! I have to contact my cable co. to find out if it is on their network I can’t find it. wish me luck Love Betty White and all the girls. LOVE THE SHOW, BETTY LOVE YA SINCE FOREVER. KEEP UP GOOD WORK AND ENJOY GOOD HEALTH. WHERE DO I SIGN UP FOR FREE TRIP TO MEET THE GALS.